In digital age, it seems like everyone seems interested in hearing only the kind of news they want. Conservatives have their source for news, liberals have theirs, and everybody has their own set of blogs and newspapers that they read. But the rise of the iPad may be altering that dynamic—just a little—with the proliferation of a set of news discovery apps that target your interests while exposing you to a variety of voices and sources. 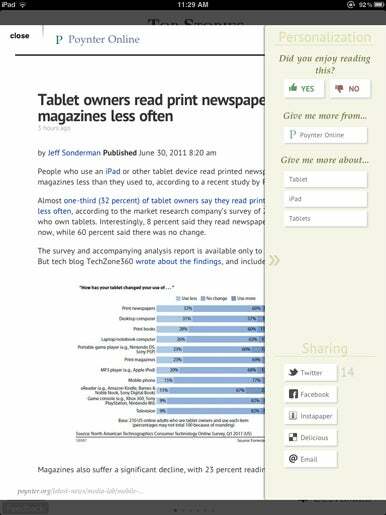 Probably the best-known—because it’s the best—is Zite ( ). It’s often compared to Flipboard, because both apps feature the elegant “personalized magazine” format that encourages a user to leisurely flip through “pages” of stories, but the two offerings do very different things. Flipboard lets you pick the sources you want to read; Zite analyzes your Facebook and Twitter feeds to produce an easily edited list of topics it thinks you’ll find interesting, then combs thousands of blogs and news sources to provide you with a range of news and commentary. News360 for iPad ( ) is an equally fine app, but it works a bit differently: it’s the brisk morning newspaper to Zite’s meandering evening read. 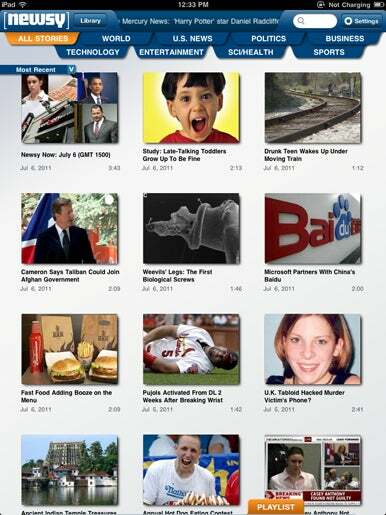 News360 gathers headlines from more than 1,000 sources, and arranges them by category: U.S. news, business, arts, and so on. News360 can also import the “likes” from your Facebook account to further shape the headlines you see. The result is a healthy mix of both the news you need and the topics you want—a tricky balancing act that flesh-and-blood editors struggle to achieve. 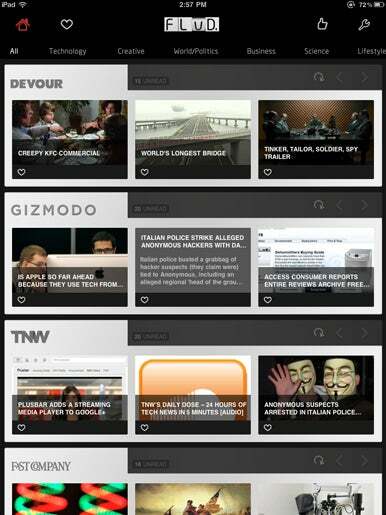 While it lacks the Zite’s design Verve, News360 is easier to look at than many news aggregators. 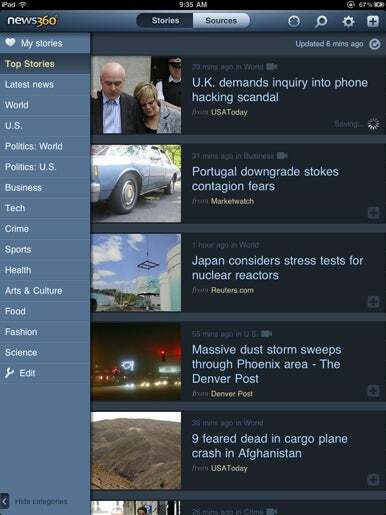 News360’s default display—a simple list on the iPad, and a slideshow of headlines for the separate iPhone version—is far more pleasing to view and use than second-tier competitors like Flud, Hitpad, and YourVersion HD. None of those apps is bad, but each has a notable shortcoming. Flud ( ) starts out with a list of featured sources, but lets you shape the experience by importing your RSS feeds. Once you import those feeds, you’re forced into the developer’s vision of how those feeds should be categorized. Those categories are listed in a menu scrolling across the top of the app page—with Technology, Creative, World/Politics, and Business being the first four options. That’s not close my preferred order, but I’m stuck with it. Flud is also hampered by a refusal to explain itself. You can eventually figure out how to place a newsfeed in the appropriate category, but the app offers no instructions to guide you through the process, and discovering the rules is a hit-or-miss affair. YourVersion HD ( ), meanwhile, dispenses with feeds entirely and focuses entirely on a topic-driven approach. It’s probably better to think of the app as a bookmarking service for your Google searches. You can save the topics that interest you, and YourVersion HD presents you with the latest and most relevant news, blogs, videos, and tweets about the topic. The app sets itself apart by including Quora results among its offerings. But getting the news you want isn’t always easy. “Politics,” it turns out, is too broad a search term: you get all the most recent articles that use the word in the headline or text. Better to save a search for “Obama” or “White House” in order to get the results you desire. And design-wise, YourVersion HD is pretty blah, with stories displayed in a style best described as “Google utilitarian.” A blue-text link, some summary info, maybe an image on the side. Hitpad ( ) also takes a topic-driven approach—the app takes the top 10 or so trending topics in the news and offers up columns of links to relevant news stories, videos, photos, Tweets, and top results from the Bing search engine. The display is a more attractive version of the grid that seems to be prevalent in so many news aggregating apps. But Hitpad’s decision to rely on and display trending stories means news junkies might be disappointed: The “top stories” section was dominated by sports and entertainment news, while news about politics and war was a bit more difficult to find. You can use Twitter and Facebook to shape your news preferences, but it’s difficult to discern how much difference it makes. All the apps mentioned above share one thing in common—they’re largely, but not exclusively, focused on text. Newsy ( ) reverses that ratio, giving users a chance to feel what it’s like to program their own TV news station. This app is more than an aggregator of video news clips: Newsy actually has an editorial staff making decisions on content. Every story—in topics ranging from national news to sports—is introduced by a Newsy anchor, and typically rounds up video clips from at least three sources. The stories generally last between two and three minutes. Users can control their experience several ways. They can drag clips down to a playlist, and run the stories consecutively—creating, in essence, a version of the nightly news that’s as long or short as they wish. They also have the option to drag clips into a library for later viewing or permanent reference. More text-oriented news lovers can read transcripts of the videos instead of watching. But I’d rather read the news than watch it, and out of this crop of apps, only Zite and News360 have found a permanent home on my iPad. 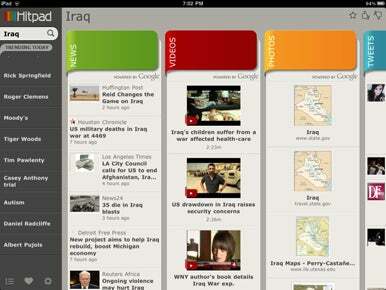 Discovering the news is a worthwhile endeavor, but discovering a great newsreading app can be difficult.